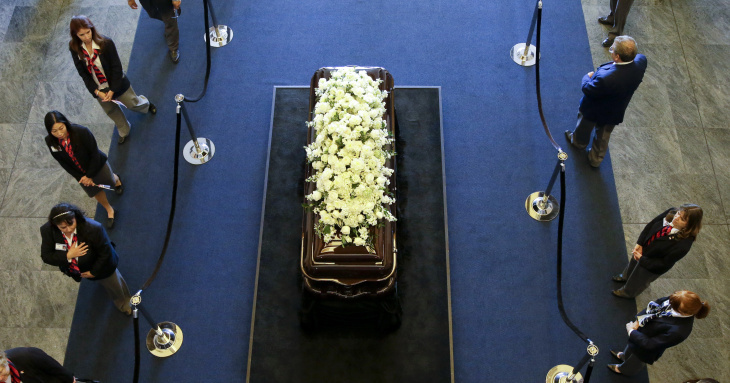 Library volunteers pause as they pay their respects beside the casket of Nancy Reagan at the Ronald Reagan Presidential Library on March 9, 2016 in Simi Valley, California. The former first lady passed away at her Bel Air, California home at the age of 94. Mark Fitzpatrick, Dir. 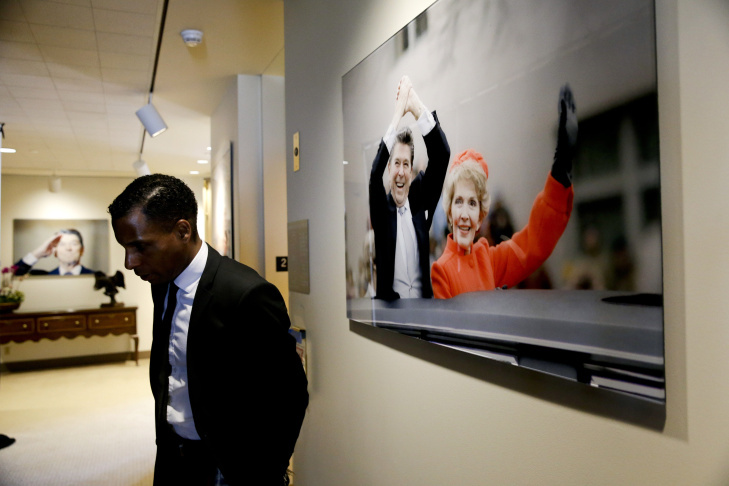 of Information Services and Projects at the library pauses near a photograph of Nancy and Ronald Reagan at the Ronald Reagan Presidential Library on March 9, 2016 in Simi Valley, California. The former first lady passed away at her Bel Air, California home at the age of 94. 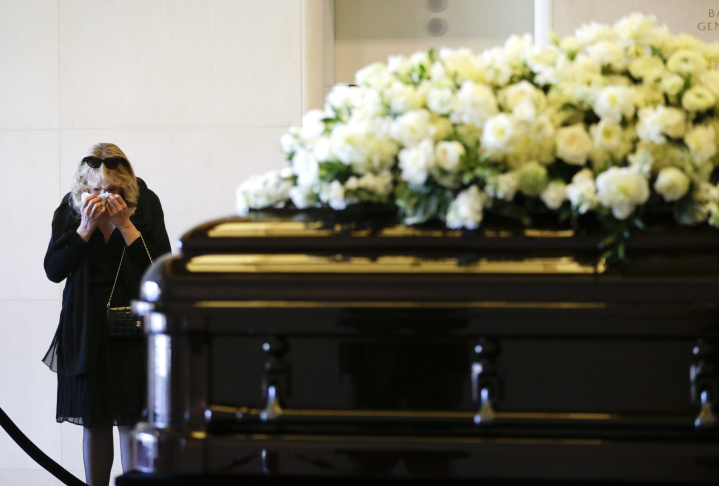 A woman wipes a tear away as she pauses beside the casket of Nancy Reagan at the Ronald Reagan Presidential Library on March 9, 2016 in Simi Valley, California. The former first lady passed away at her Bel Air, California home at the age of 94. 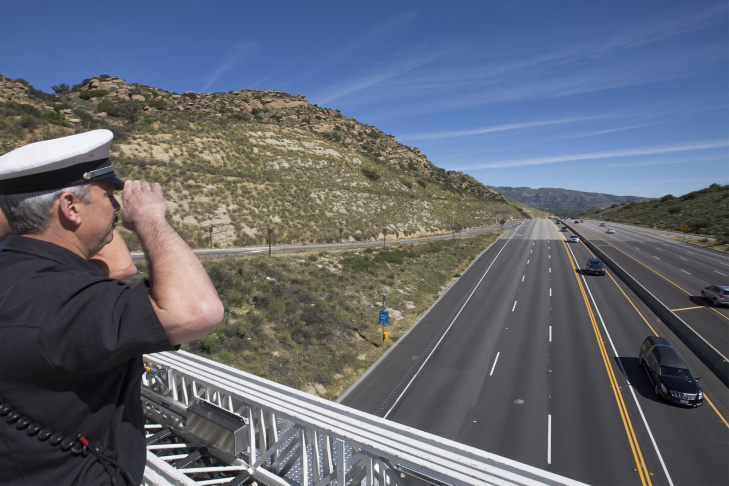 Captain Steve Perez of Los Angeles Fire Department Station 87 salutes the hearse carrying the body of former First Lady Nancy Reagan along the Ronald Reagan Freeway to the Ronald Reagan Presidential Library on March 9, 2016 in Simi Valley, California. The former first lady will lie in repose and will be buried next to her husband at the library. 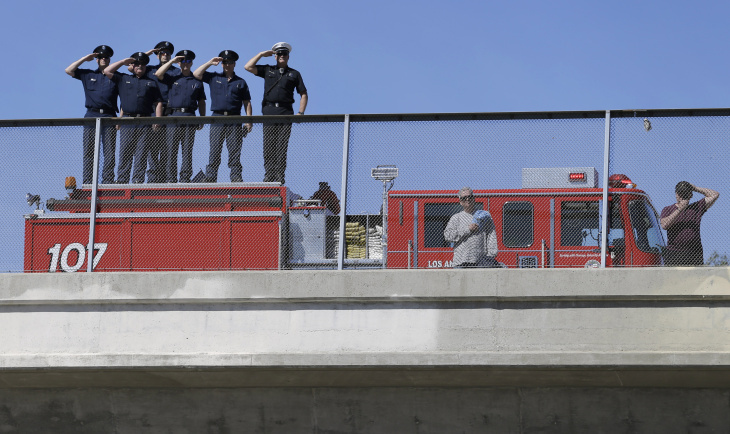 Firefighters salute as the hearse carrying the body of Nancy Reagan makes its way to the Ronald Reagan Presidential Library on March 9, 2016 near Porter Ranch, California. The former first lady passed away at her Bel Air, California home at the age of 94. Thousands of people made their way to the Ronald Reagan Presidential Library Wednesday to pay respect to Nancy Reagan as she lay in repose. It was the first of three days of formal mourning for the former first lady, who passed away over the weekend. Politicians, public figures and local admirers turned out on a day of sunshine and blue skies to show their support and share their memories of Reagan. So many people showed up to pay their respects to Mrs. Reagan on the first day that the four buses running between the guest lot and the library at 1 p.m. weren't able to accommodate them all. The library increased the number of buses to 10 at 3 p.m. and then to 15 at 4:30 p.m., according to a statement from the library. By 5 p.m., over 1,000 people were still waiting at the off-site location to board buses. 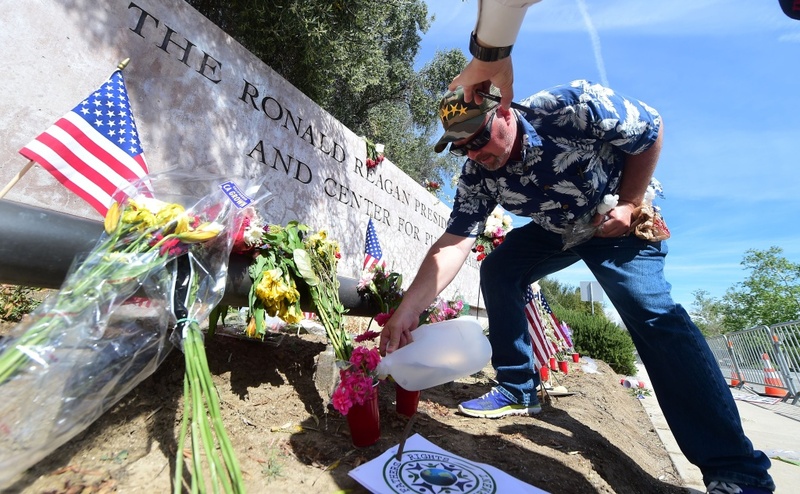 San Luis Obispo resident Dane Senser adds water to flowers at a makesihft memorial for the late Nancy Reagan outside the Ronald Reagan Presidential Library in Simi Valley, California on March 9, 2016. 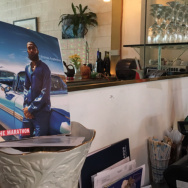 Earlier in the day, a small, private ceremony was held at a mortuary in Santa Monica. According to the Associated Press, the guest list included former President George W. Bush, first lady Michelle Obama, former first lady Hillary Clinton, Katie Couric, Chris Matthews, Newt Gingrich, Wayne Newton and Mr. T.
AP reports that Reagan herself planned the flower arrangements, the music to be played by a U.S. Marine Corps band and the people who received invitations to the private memorial. Members of Reagan's Secret Service detail carried her casket from the mortuary and loaded it into a hearse. A procession followed, with a motorcade escorting the first lady's body to the Reagan library for a public viewing that will continue on Thursday. The road up the hill to the library was lined with dozens of tiny American flags, and bouquets of flowers were placed at the entrance Wednesday morning. James Rothbart of Westlake Village was one admirer who took a day off work and turned out early to pay respects. 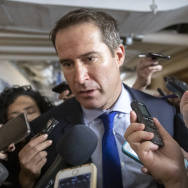 "I'm a Democrat. 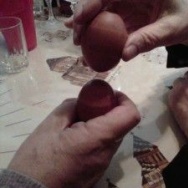 Today it's not about that. It's about an American. It's about a first lady who has a lot of grace and dignity who had a lot of reverence for the White House and country and her husband, and it's refreshing and should be embraced, and today is why I'm skipping work," Rothbart said, adding that he was not the only one to take off work for the event. Hilary Anne Kurtz was one of the first people in Simi Valley waiting to see the first lady. She remembered meeting Reagan back in 2000 while shopping in Beverly Hills. Kurtz said Reagan "couldn't have been nicer" as the two exchanged a few words. She went on to run her errands but bumped into Reagan again at the valet. "And it was just a treat to really have that opportunity and to be literally a foot away from her," she said. Tracy King was there with her mom. She told KPCC the Reagans hold a special place in her heart because the former president served in the White House when she was in high school. She said while America lost a first lady, the Reagans have lost a mom. "How do you go home tonight and you don't have your mom there no more? We see her as a famous lady, but she's somebody's mom. And that's what we have to think about — we all have moms, but she's a special mom," King said. On Friday comes the funeral itself. Nancy Reagan will be laid to rest by President Ronald Reagan on a hillside tomb facing west toward the Pacific Ocean, according to AP.